At this time of year in Melbourne, as spring begins to look more like summer, I spend a lot of time wandering around the garden, talking to myself. While it may seem aimless to an observer, I’m actually mapping out in my head where the summer crops are going to go. With any garden, especially those that are short on space, it’s important to have at least a vague plan before the start of each new season. In the past, when I had small gardens, I’d put a rough plan down on paper (based on what grew well and where the previous year), so I wouldn’t forget. I also reduced my crops to things we liked most, to conserve space and to avoid ending up with five golden squash or a handful of beans, for example, which is a bit pointless. Now, either my memory has improved or the process has become so embedded that I plan the next crop in my head, and often I start planning halfway through winter. And this does involve some heated internal conversations and debate. There are a few basic principles, though, that can guide your plan for the next season’s vegies, regardless of how much space you have. As mentioned in a previous post, I’m now lucky enough to have the space to leave a bed lying fallow each season. As I had such a bumper crop of tomatoes in the bed on the right last summer, I’ve been building it up with compost and manure throughout the winter, and next weekend I’ll be planting out my tomato seedlings, propagated from last summer’s tomatoes (see A Pocket Full of Seeds). A key to healthy tomatoes is to avoid putting them in a bed where you’ve had Brassicas. And never, ever plant them next to each other – Brassicas are toxic to tomatoes and stunt their growth. 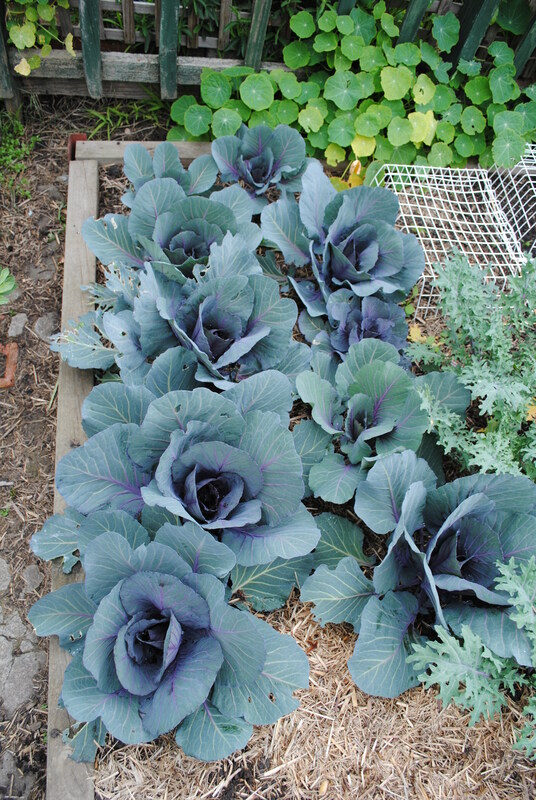 A number of the crops illustrated above are either going to seed or nearly ready to harvest, such as these beautiful red cabbages, in whose future I see coleslaw and sauerkraut. So now it’s a matter of waiting and planning, and becoming a little impatient. In the next few weeks I’ll pull out the plants that are going to seed, leaving one or two in order to collect the seeds for next year. I don’t attempt Brassicas in summer, as the cabbage moth is too difficult to combat organically, and ending up with broccoli writhing with green caterpillars is not at all rewarding. Even the kitten, who has shown herself to be an able moth hunter, won’t keep up with the proliferation of this pest in summer. The more you grow your own vegetables, the better your understanding of companion planting and/or crop rotation. Listening to gardening radio shows, talking to other gardeners, reading gardening blogs (The Garden Doctor is a good ‘un) and observation of your own garden – the changing light and shade – are the best sources of knowledge about what, when and where. For example, my snow peas (masses of ’em) are contributing nitrogen to the soil where the tomatoes are going; broad beans are another fantastic green manure, so, when they’re done, I’ll dig most of the plants back into the bed, adding cow manure and compost for a dynamic mix. I’ll probably put more tomatoes in that bed, taking advantage of all that naturally-added nitrogen. You’ll notice a lot of question marks. That signifies the ever-changing pattern of my thoughts. A few things are confirmed however; the tomatoes are going where the drawing says they are going and heritage ‘Marketmore’ cucumbers (sourced from CERES Nursery) are going up the trellis once the snow peas are finished, as these cucumbers lived up to their name last summer (I even had enough to make dill pickles, which we are still eating). I’ve already planted zucchini and golden squash in my other bed, along the west-facing fence, and surrounded them with bush beans, as I’ve noticed that the zucchinis and beans grow well together. So, this frees up more room in the middle and left hand beds for other things. The internal debate continues, but having a rough idea drawn up certainly helps with focusing your thoughts when visiting your local nursery or propagating your seeds. Of course there are all the uncertainties that can come between you and your summer vegies in Melbourne and surrounds – the dry north wind, 40+ degree days, little or no rain. Every year is a learning curve as far as our summers are concerned, and basing your planting decisions on what worked well last summer, and thinking about why it might have worked or where it might work better, could mean the difference between a season of disappointments or one of great bounty. 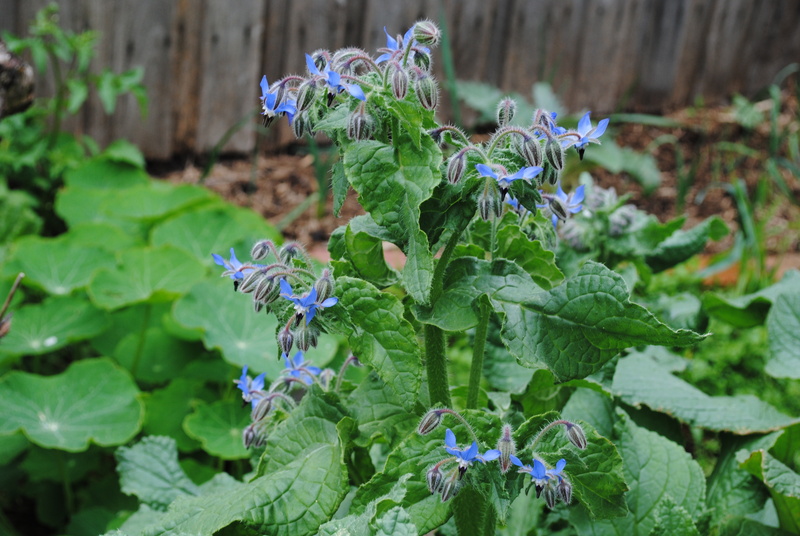 Borage, one of the best of garden companions, conditions the soil and draws bees in their hundreds. Note: The title of this post is my favourite, if slightly politically incorrect, palindrome.